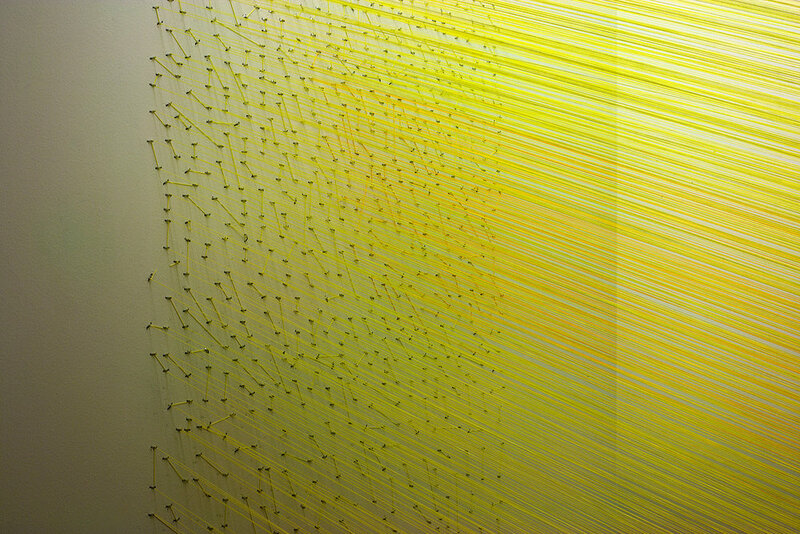 slant yellow is the first thread installation I made; the concepts grew out of a residency at the Omi International Art Center in 2009. Three weeks in upstate New York in Ghent, NY brought forth a time of rich experimentation, choice of material and a significant shift in conceptual focus. High on the second floor of a large historic barn, the quality of light was magical as it cast of blue-ish chroma into my white walled studio. Quickly, I found myself crudely pinning yellow thread between walls in order to bring emphasis to the blue natural light. Upon returning to my studio, I began to engineer this idea and to expand upon the gestural potential, expression of tension, and use of color. This small work for a collector's residence gave me prime opportunity to develop a method of "drawing in space." slant yellow is a simple diagonal form in a small alcove space that encounter upon entering the condominium of this enthusiastic collector.